This beautiful woman is Tess Hilmo. Do you know Tess? She writes the most thoughtful blog posts and is one of my critique partners. We met at the Highlights Foundation Summer Workshop in Chautauqua, New York in 2008. We immediately connected. This beautiful hardback book is now available. You can get it on Amazon or at B & N.
While I was in England my copy of With A Name Like Love arrived. I was so excited! Any time one of your writing friends has success, it's like you have a little success and a lot more hope for your own success. I mentioned to Tess that I would like to do a post about WITH A NAME LIKE LOVE and she said she'd like to donate a copy for a drawing (U.S. only). She also sent me 6 beautiful bookmarks to give away (everyone is eligible). To win, follow Tess and leave a comment here. I would love it if you would Tweet or post on Facebook about the give-a-way (I have those handy little buttons at the bottom on my posts. )...I want everyone to know about WITH A NAME LIKE LOVE! Kirkus gives With A Name Like Love a starred review! Hilmo creates a family, a town and a mystery that readers won’t soon forget. In July of 1957, the Love family rolls into the tiny town of Binder, Ark. Reverend Everlasting Love, his wife Susanna and their daughters Olivene (called Ollie), Martha, Gwen, Camille and Ellen set up camp so Reverend Love can preach for three evenings before they load it all up again and head to the next small town down the road. Such is the life of an itinerant preacher’s family. But there is something different about Binder, Ark., something strange enough to cause the family to stay a while longer. Ollie meets a boy named Jimmy, whose mother is in jail for killing his brutish father. Jimmy insists she didn’t do it, but everyone else in town is convinced she did. Poor Jimmy could certainly use a friend. The Love family, particularly Ollie, cannot abide the injustice, but what can they possibly do to help? And just how long will they stay in Binder, anyway? There is, after all, a boarded-up church in the center of town needing a preacher, and Ollie, for one, would sure love to stay put for a good long while. Hilmo relishes her small-town setting and develops her characters with affection. Readers will become caught up in events as firmly as Ollie is. I hope you will hop over and check out Tess here and here...then wait until October 24th to see if you won a copy of WITH A NAME LIKE LOVE or a bookmark...then...if you didn't win click here or here to buy your own copy. You won't regret it! Aw, thanks for this shout out Sharon ... so blessed to be part of such a supportive community. And I can't wait to return the favor when you have your first release -- I'll be cheering the very loudest :D! Lovely!!! Nice to meet you Tess and good luck with your gorgeous book with such amazing names of both place and characters!! You sure got me interested. Thanks and have a great end of the week. Tess sure sounds way cool, and so does her book! I can't believe I wasn't following Tess before this! Rest assured I've remedied the situation. Congratulations on your book publishing! It sounds like a beautiful and intriguing story. Sharon, thank you for sharing Tess' blog and book. This sounds like a beautiful book! I'll post this on my sidebar. What a great give-away, and congrats to Tess on her book release! Add me to the pot, and I'll go over and follow her right now! It's fabulous to meet you, Tess! Congratulations on what looks and sounds like a lovely book. (Love) Sharon has been an inspiration to me. And being friends with you, I know you must be special. Off to visit your site! It sounds so good, and I love the title. Congrats to Tess! Also, I'm happy for both of you, having each other as crit buddies. Critique partners are sooo special! I love mine! I'm here via Sheri Larson's Pay it forward post. It's nice to meet you. You are so right, I love sharing in my writer friends' success. This looks like a fun give-a-way Sharon! Oh, I hope I win! I'm obsessed with the cover. I may buy it before you announce it though, haha. Gosh, I just keeping hearing more and more great things about this book--and now I HAVE to read it! Over from Sheri's blog and new follower! I can't wait to read Tess's book. Her cover is gorgeous. Ohh! Sounds wonderbar! I'm in, all the way. Hi, I am dropping by because Sally over at the "pay it forward" blogfest highly recommends your blog. I am new & trying to get to know more bloggers. I will be back to read more after this blogfest. It is so nice when writers, like yourself praise their critique partners. I love to see that. Sharon--thanks for stopping by my blog and for introducing me to Tess. :) The book cover is great and sounds awesome. I'm hearing so much about this and looking forward to getting it. I'm already a follower of Tess's and I tweeted FB and G+ 'd! I can't wait to read this book. I'm outside the US so don't enter me in the book draw - I'll pick up my own copy though! yay for Tess! Agreed! Brilliant writer! I just finished reading this and it was amazing! Great review and lovely support for a lovely person. You rock, Sharon! 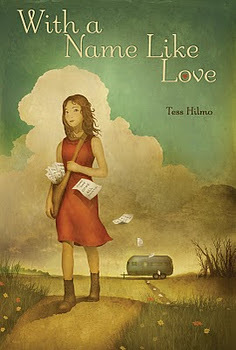 Congrats to Tess - With a Name like Love is an amazing book! Oh, my goodness. That sounds like such an awesome book! And that title! That's a really fabulous title. I love when CPs have writing successes! I could have sworn I already commented on this post...think I'm losing my mind. Anyway, I DO love the cover.